A century ago, the medical establishment considered Dr. Will and Dr. Charlie Mayo radical for inventing the integrated group medical practice. Today, Mayo Clinic Social Media Network (MCSMN) continues their legacy by inviting practitioners, patients and caregivers to become actively engaged with one another through social media. Bringing the Social Media Revolution to Health Care goes beyond “how to” and provides strategic reasons to integrate social media into health care communications. 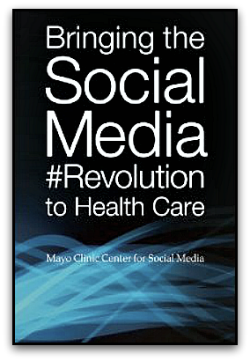 Essays by thought leaders and active participants in health care social media bring the strategy and practice of social media to life. ($9.95 Paperback) is available on Amazon. eBook version (Kindle or PDF) is FREE for Basic and Premium members of MCSMN. Learn how to download your free copy. Generate conversation in your organization by sharing this book. Purchase copies in bulk from CreateSpace. Enter discount code Z4L7DBSN to save 40 percent off the cover price.